Our client companies and organizations frequently need to send their representatives to visit their in-country markets. Often, even employees who don't travel overseas have to conduct business with their counterparts across the globe. While your staff may be able to get away without knowing anything about the local language and customs, your business is likely to run more effectively and efficiently if you provide some up-front cultural and language instruction. 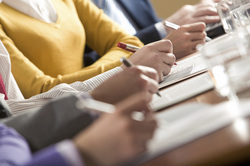 RABI's Training Group carefully designs and presents individualized training and group seminars for all types of client needs. Our customized solutions and specialized trainers provide language instruction and courses in local culture and customs. Our instructors are not only qualified and carefully selected, but also experienced in the specialty requested. Easy-learning, fun, and patience are the principles of all our instructors. 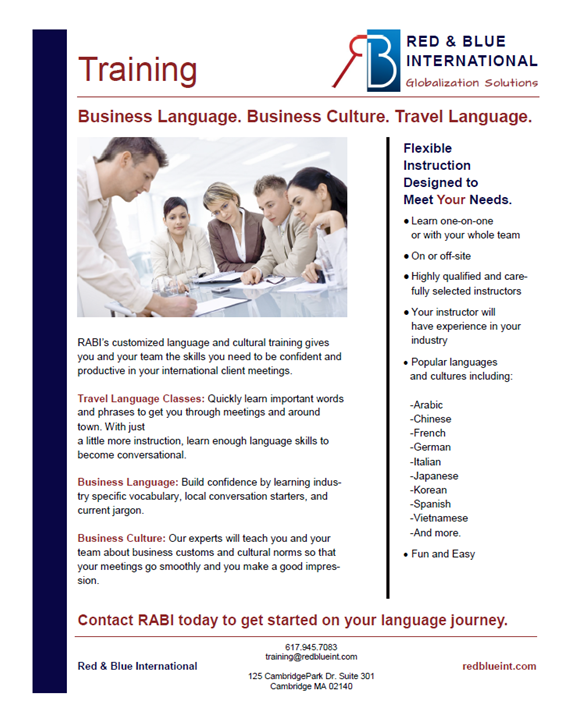 Download and share our Language Training Services data sheet.